"Art is one of the prime ways we have of opening ourselves and going beyond ourselves. That's what art is: it's the product of the human being in the world and imagination, all coming together." To help support all of our volunteer and pro bono efforts, we'll soon be offering a few unique services to those looking to incorporate the arts into their events and/or daily office life. We're currently in the process of cleaning up the text and pricing for these services, but if you've been to any of the print-shop-pop-ups we've done with ArtsWave and/or SummerFair Cincinnati you've already experienced a bit of the energy we're looking to provide on a more regular basis. 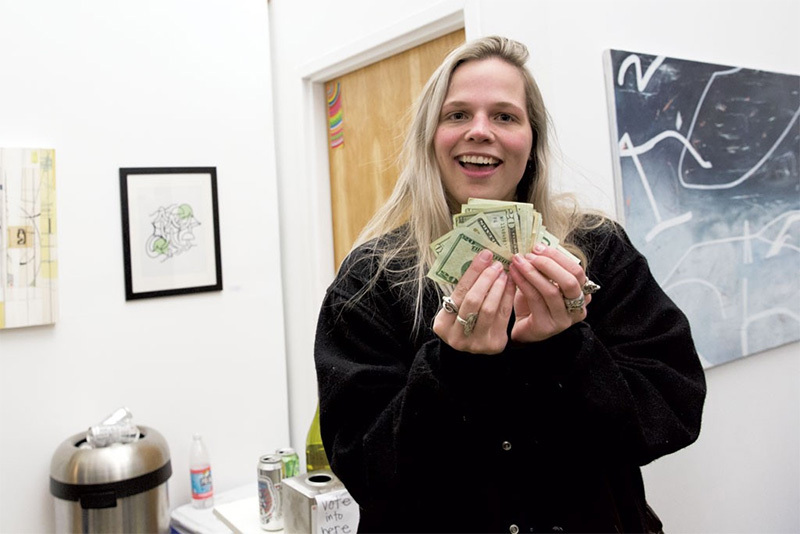 For now though, please enjoy this photo of Maggie Kniffin (courtesy of TOMMY DELITTO), showing off her winnings from "The Art Show IV" in Vermont. If interested, hop over to Seven Days VT for a quick read about how artist & galleries are finding ways to support one another ...because, you know, who wants to be or see artists actually starving?! ?